Home Edwards, A. S. G., ed. A Companion to Middle English Prose. A Companion to Middle English Prose. Edwards, A. S. G., ed. Title: A Companion to Middle English Prose. 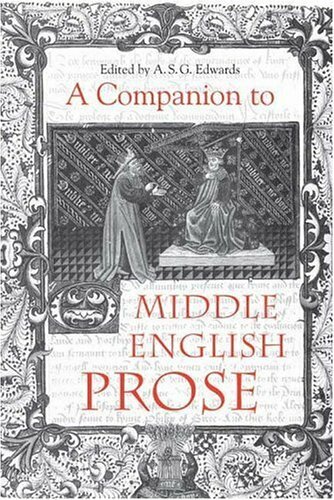 The essays in this volume provide an up-to-date and authoritative guide to the major prose Middle English authors and genres. Each chapter is written by a leading authority on the subject and offers a succinct account of all relevant literary, history and cultural factors that need to considered, together with bibliographical references. Authors examined include the writers of the Ancrene Wisse, the Katherine Group and the Wohunge Group; Richard Rolle; Walter Hilton; Nicholas Love; Julian of Norwich; Margery Kempe; 'Sir John Mandeville'; John Trevisa, Reginald Pecock; and John Fortescue. Genres discussed include romances, saints' lives, letters, sermon literature, historical prose, anonymous devotional writings, Wycliffite prose, and various forms of technical writing. The final chapter examines the treatment of Middle English prose in the first age of print. Contributors: BELLA MILLETT, RALPH HANNA III, AD PUTTER, KANTIK GHOSH, BARRY A. WINDEATT, A.C. SPEARING, IAN HIGGINS, A.S.G. EDWARDS, VINCENT GILLESPIE, HELEN L. SPENCER, ALFRED HIATT, FIONA SOMERSET, HELEN COOPER, GEORGE KEISER, OLIVER S. PICKERING, JAMES SIMPSON, RICHARD BEADLE, ALEXANDRA GILLESPIE. Contributors: BELLA MILLETT, RALPH HANNA III, AD PUTTER, KANTIK GHOSH, BARRY A. WINDEATT, A.C. SPEARING, IAN HIGGINS, A.S.G. EDWARDS, VINCENT GILLESPIE, HELEN L. SPENCER, ALFRED HIATT, FIONA SOMERSET, HELEN COOPER, GEORGE KEISER, OLIVER S. PICKERING, JAMES SIMPSON, RICHARD BEADLE, ALEXANDRA GILLESPIE.